Home » Blog » Avoiding Cesarean: What is a Doula? The word “doula” comes from the ancient Greek meaning “a woman who serves” and is now used to refer to a trained and experienced professional who provides continuous physical, emotional and informational support to the mother before, during and just after birth; or who provides emotional and practical support during the postpartum period (Source). Historically, a woman lived near her family when giving birth and could easily call on her mother or sister for support during the labor. And for most of the history of birth, women’s family members would have experienced natural childbirth themselves so they would have had a good idea of how to assist the next generation. When birth became more medicalized and people stopped living near their families all their lives, normal childbirth became very difficult to achieve and very unfamiliar to women as a whole. Studies have shown that overall, women who received continuous support were more likely to have spontaneous vaginal births and less likely to have any pain medication, epidurals, negative feelings about childbirth, vacuum or forceps-assisted births, and C-sections. In addition, their labors were shorter by about 40 minutes and their babies were less likely to have low Apgar scores at birth (Source). In most cases, doulas have experience with birth from the births of their own children. Their experience might have been positive or negative. Either way, they walked away from their birth wanting to help other women during labor, birth and postpartum. 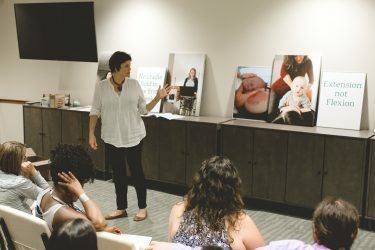 The training for doula certification involves reading recommended materials, attending classes and going to a certain number of births free of charge. There are several different organizations that certify doulas but the 2 largest groups are Doulas of North America (DONA) and Childbirth and Postpartum Professional Association (CAPPA). In the New York/New Jersey area, a doula will generally charge between $700 and $1200 for their services. They generally meet with their clients several times prior to the actual birth. Once a woman is in labor, she can call her doula to talk about what she is feeling. The doula gives a woman the reassurance that she needs to continue to labor at home. Without the support of an experienced labor support person like a doula or midwife, many women would be very unsure about staying at home in labor. Many doulas visit a woman at home during early labor and help her make good decisions about whether she should rest or try to stimulate her labor. She will help her stay hydrated and well-fed. Just the presence of the doula will allow a woman to relax and progress in labor. Many doulas journal the labor for the woman and often doulas take photographs so the family has one less thing to worry about. Once in the hospital, the woman can ask her doula to explain the common procedures and help her make decisions about her care. A doula is not intended to be a medical expert at all. She is just there to suggest ways to make the birth as positive as possible. For example, if the woman wants to avoid Pitocin, the doula can encourage the mom to ask if she could walk or use a birth ball to help her labor progress. Once in labor, it is very difficult for a woman to remember her birth plan, so the doula can be her memory! Meet with more than one doula before deciding. The interviews will help you find the person who most shares your vision for your birth. Look for a personality that makes you feel comfortable – you will be sharing a very intimate part of yourself with her. Some women will gravitate towards a “mom” type person and others will prefer more of a friend. You may want someone with a lot of energy and enthusiasm or you might be more comfortable with a quiet “zen-like” person. You might do better with someone directing you so that you don’t have to make decisions or you may wish to be self or partner-directed in labor. Consider whether you would appreciate a hands-on doula or if she would suit you better by being more emotionally supportive. Ask for references. Just to be on the safe side, it is a good idea to talk to other clients to be sure that you have made a good choice. Ask the women what they liked the most and the least about the doula. Sometimes the things they didn’t like will be just what you want! Choose a doula who lives near your home. When a doula lives a distance from you, more than 30 minutes, it is very likely that she will hesitate to just stop by to check on you in early labor. You may not need her to stay, but many women would appreciate the reassurance of a visit. Having the doula nearby keeps her fresher and rested. If the doula can come and go quickly from your early labor, she can get back to her house for a shower, snack or nap and then come back. You often want the freedom to have your doula involved in the very end of pregnancy and earliest beginnings of labor but you don’t want her to be exhausted when labor is very strong and you need energy, not yawns! Be sure the doula will come to your house. Meeting the doula at the hospital, a growing trend in the doula world, certainly defeats the purpose for hiring the doula. A doula is so helpful when she arrives early. You are ready to see the first member of your birth team once labor has established itself and have her help you habituate the coping mechanisms that you will continue to use once labor advances. She can help make the decision about when to call your provider and when you need to make the trip to the hospital or birth center or when the midwife needs to come to your home. Of course, there are times when she cannot meet you at your home. If the labor is going too quickly or if you have to be induced, certainly it is appropriate to have the doula meet you. Be clear about the fees you are expected to pay. Ask if there would be a refund or discount if the labor went so fast she didn’t get there or if you did not use her services in the end; an example would be a sudden need for a surgical birth without labor having yet started. Find out who will fill in if the doula cannot come to your birth. No person can promise that she or her family won’t be sick, that her car won’t have a problem or that another of her clients won’t be in labor at the same time. Make sure she has another doula to cover her in an emergency. While hiring a doula may seem an unnecessary expense, avoiding unnecessary birth interventions and feeling positive about your baby’s birth day is worth it. Additionally, having a doula involved in your pregnancy, labor and birth has been proven in studies to increase your odds for vaginal birth.